Who has been the best goalkeeper in Europe this season? The football season across Europe has drawn a close, and Champions have been elected in all the major leagues across the continent. Every season, we always have a standout performer from each of these leagues. Almost inevitably we tend to focus on the strikers and midfielders, when we discuss the standout performers, and often overlook the contribution of one the most pivotal figures in a team—the goalkeeper. In our quest to determine who has been the best goalkeeper in the 2015-16 season across the top-five leagues in Europe, we start by forming a pool of keepers who have stood-out in their respective domestic leagues. Clean sheet is the most mainstream statistic on which a goal keeper’s performances are determined. The common convention is: higher the number of clean sheets better is the goalkeeper. However, that statistic alone can never paint the whole picture. A clean sheet also depends on the performance of the whole defence, and also how clinical the opponents are. So we need to bring in other statistics as well in order to determine the winner. The Premier league this season saw the immense rise of Leicester City, which has been nothing short of a fairytale. While the likes of Jamie Vardy, Riyad Mahrez and Ngolo Kante carved a name out for themselves this season, their goalkeeper Kasper Schmeichel himself had his most successful season till date. With 15 clean sheets to his name, he is tied with David De Gea and Joe Hart, and one behind Petr Cech, who is leading the table with 16. 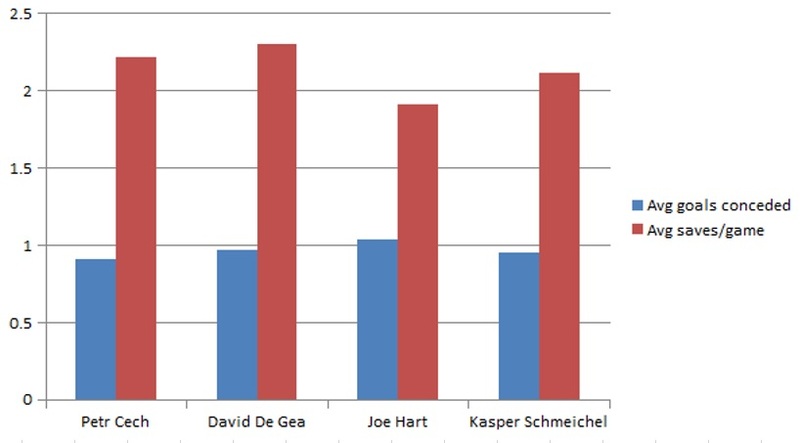 As we can see, DDG leads the way for average number of saves in a game (2.3), while Cech leads the way in average goals conceded (0.91). Joe Hart, despite keeping 15 clean sheets, has worryingly conceded 1.03 goals per game. Kasper Schmeichel has also had an immense hand in Leicester’s title winning campaign with 2.11 saves a game, and has conceded an average of 0.95 goals a game. 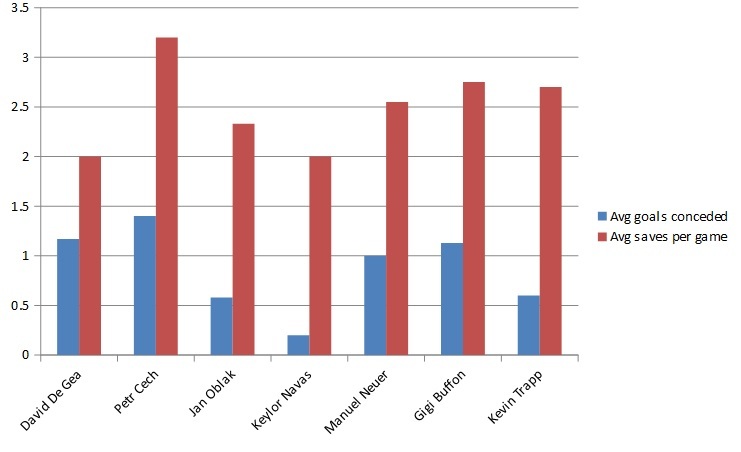 As for punching and claiming goes, Joe Hart leads the way with 69% and 96% respectively. 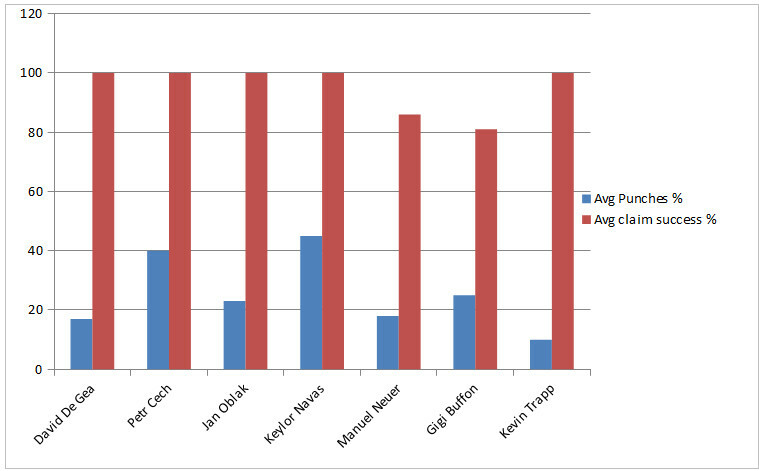 However, Cech and David De Gea are not far behind. Despite Cech’s wanting weakness in the near post or DDG’s vulnerability in catching and clearing crosses, both have had great seasons with their respective clubs and are the standout goalkeepers from the Premier League. Pick: Petr Cech and David De Gea. Real Madrid finished 2nd in La liga, a point behind Barcelona, and have also lifted their 11th Champions League crown. Apart from Ronaldo's telling contribution in it, another major reason of their success has been Keylor Navas. An astonishing 9 clean sheets in 11 appearances, he has conceded at an average of 0.27 goals per game—the least in the Champions league. With an average of 0.82 goals per game conceded in La liga, Navas gave the best performance by a Real Madrid keeper on that front. He also leads in the punching and claim success departments. On the other hand, the keeper from the red side of Madrid has experienced a stellar season as well. With 24 clean sheets and with an average of 0.47 goals conceded per game, Jan Oblak has been a rock at the back for Simeone's men. Claudio Bravo started from where he left last season – Barcelona’s indispensable number 1 goal keeper in the league. However, his number of clean sheets dropped down from 23 last year to 16 this year, and while his average saves per game rose from 1.59 to 2.13, it’s pretty evident that Barcelona haven’t been as defensively sound as they were last season, despite their La Liga winning campaign. 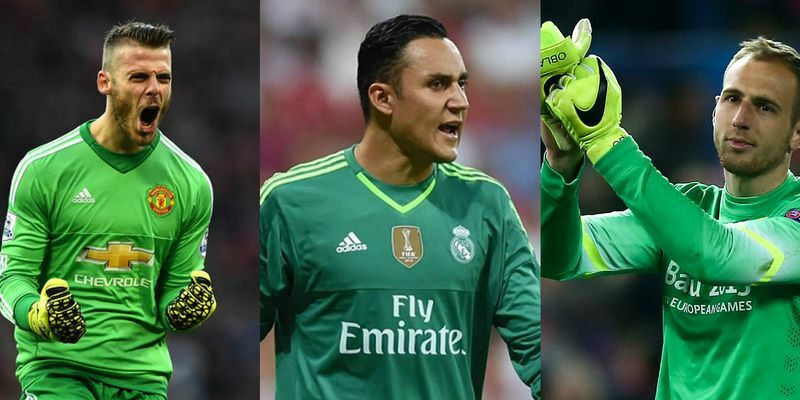 Pick: Jan Oblak and Keylor Navas. Yet another Serie A for Juventus, yet another extraordinary season for Gigi Buffon, who seems to only get better with age. Buffon kept a total of 21 clean sheets this season, 3 more than last season, and his average goals conceded this season in comparison to last season dropped almost by one goal, from 1.27 to 0.49. Buffon made 1.80 average saves/game, an increase of 0.10 from last season, undoubtedly proving to be one of Juventus’s standout performers this season. On the other hand, Samir Handanovic, with his performances, helped Inter Milan finish 4th, 4 places above what they managed last season, to secure a Europa league spot for next season. He kept 15 clean sheets this season, an increase of 4 from last season, while his average goals conceded dropped from 1.27 to 0.94 this season and saw an increase in his average saves/game from last season – from 2.11 to 2.44. 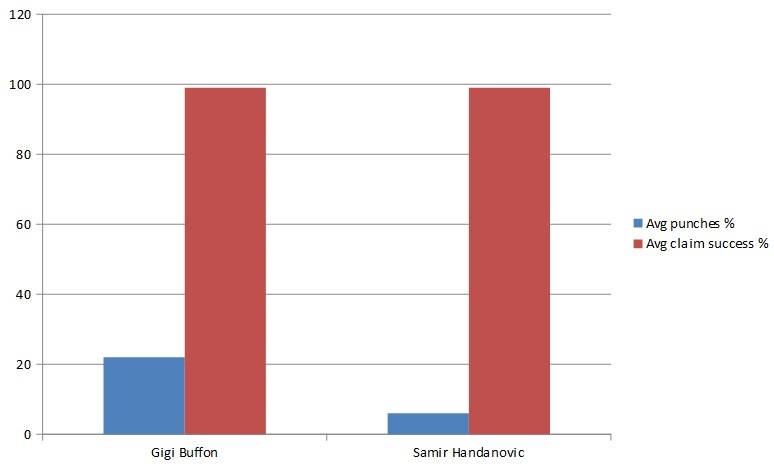 While both keepers are tied with 99% claim success, Buffon slightly leads in punching the ball out of the box. 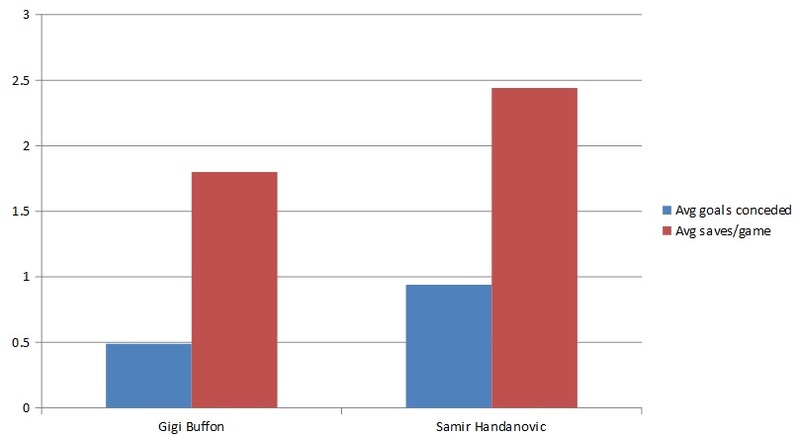 Despite all of this, it is quite clear Buffon has been the better keeper by quite a margin and thus is our pick from Serie A this season. Bayern Munich’s unprecedented dominance in the league under Pep Guardiola continued and so did Manuel Neuer's. A fabulous 20 clean sheets in the league this season, with the next best being 13, he has become a cornerstone in one of the stingiest defenses across Europe. 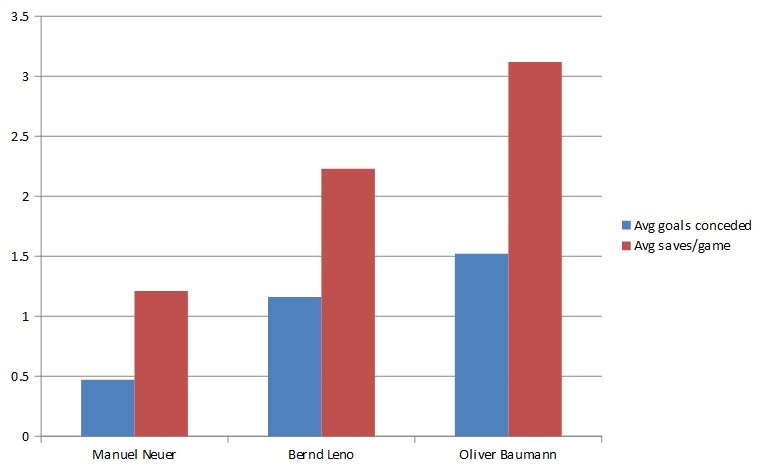 Leno and Baumann deserve a shout out as well, particularly the latter, whose efforts has kept Hoffenheim out of the relegation places, while Leno’s 13 clean sheets, and an average of 2.23 saves per game has helped Leverkusen to qualify for the Champions league. 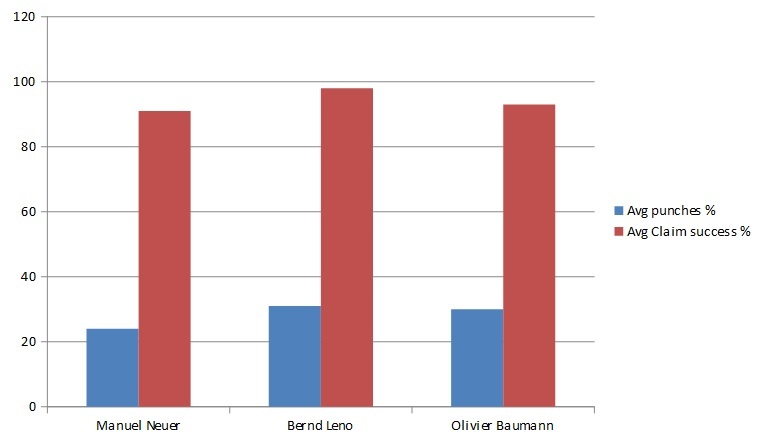 However, Manuel Neuer comes out as the clear winner here in this race. Kevin Trapp has had an inconsistent season, but statistically his numbers were quite great as PSG romped to yet another league title. Keeping a total of 18 clean sheets, he conceded at an average of 0.54 goals per game, which is the lowest in the league. 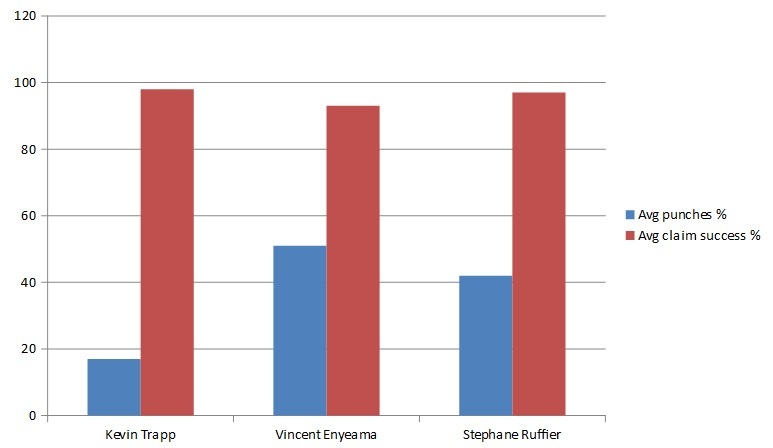 Enyeama kept a total of 18 sheets as well and conceded at an average of 0.69, while Ruffier kept 16 clean sheets and conceded at an average of 0.97 goals a game. Though their teams have nothing to show for their performances, both the keepers have had great seasons from a personal point of view. But it is Trapp who stole the show in the goalkeeping department this season, and in the process being PSG’s numero uno keeper over Salvatore Sirigu. So to determine the best goalkeeper in Europe this season, we consider the statistics across the Champions League this season for the mentioned keepers. As one can see, Keylor Navas has been the standout keeper in UCL this season keeping a mammoth 9 clean sheets and conceding at an average of just 0.27. 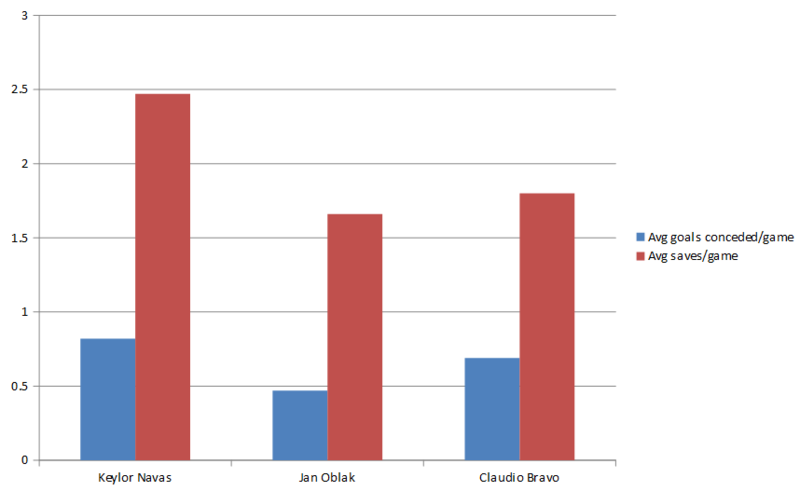 He is closely followed by Oblak, who has kept 8 clean sheets, and conceded at an average of 0.62 game. 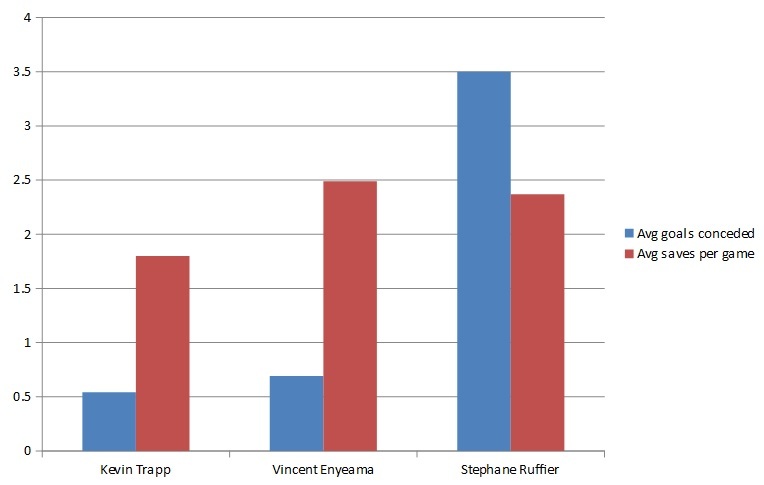 Kevin Trapp comes 3rd, keeping 4 clean sheets and conceding at an average of 0.60, but sadly he couldn’t continue further due to PSG’s early exit. David De Gea, Gigi Buffon and Petr Cech have had forgettable campaigns in Europe. Although Bayern Munich reached the semi-finals, Neuer didn’t have a great tournament. The German custodian conceded at an average of a goal per game, and the glaring mistake against Olivier Giroud’s header summed up his season in Europe. On basis of the data gathered and analysis made, it’s pretty clear that there are not one but two standout keepers in Europe this season, and astonishingly, both of them are from the two Madrid teams—Keylor Navas and Jan Oblak. Although Real Madrid came out on top in the Madrid derby in the final, both the keepers kept their teams in the game for a very long time with vital saves. Ironically, it would eventually be the goal post which decided the outcome of the final. Avid Arsenal supporter and a keen interest on the tactical side of the game. Mesut Ozil fanboy.